KNIME Server is the enterprise software for team based collaboration, automation, management, and deployment of data science workflows, data, and guided analytics. Non experts are given access to data science via KNIME WebPortal or can use REST APIs to integrate workflows as analytic services to applications and IoT systems. A full overview is available here. For an overview of use cases, see our solutions page. Presentations at KNIME Summits about usage of the KNIME Server can be found here. For a full list of product offerings including KNIME Analytics Platform, see here. The KNIME Server (BYOL) instance requires you to Bring Your Own License file to use. To obtain a license file you should contact your KNIME representative, or sales@knime.com. KNIME Server Medium, and BYOL are single VM instances, and are most easily launched via the Azure portal. If you are familiar with the Azure CLI, or Powershell you may also use this deployment method. For self-build deployments using a custom base image, you should consult the KNIME Server Installation Guide. If you are looking for detailed explanations around the additional configuration options for KNIME Server, you can check the KNIME Server Administration Guide. There are additional resources such as the KNIME Server Advanced Setup Guide and KNIME Server Preview Functionality Guide. The person responsible for the deployment of KNIME Server should be familiar with basic Azure functionality surrounding configuring Azure VMs. KNIME Server administration requires basic Linux system administration skills, such as editing text files via the CLI, and starting/stopping systemd services. KNIME Server Medium, and BYOL are single VM images and contain all software requirements. For self-build instances, please consult the standard KNIME Server Installation Guide. Launching a VM requires a new (or available) resource group. Within the resource group a Public IP address, Network Security Group, Virtual Network, Network Interface and Virtual Machine are deployed. The default Network Security Group will enable HTTP access on port 80, and HTTPS access on port 443. SSH access to administer the server defaults to port 22. Optionally KNIME Server Large instances (currently available via BYOL license only) may choose to connect KNIME Server to an external LDAP/AD service. Full details are contained in KNIME Server Advanced Setup Guide. An overview of the general KNIME Server architecture is supplied. More detailed description of software architecture can be found in the KNIME Server Administration Guide. KNIME Server Medium run as a single VM instance in a single subnet of a Virtual Network. Use of an Public IP is preferred since it simplifies the update/upgrade procedure. Configurations specific to KNIME Server running on Azure are described below. KNIME Server does not require to authenticate with any Azure provided services. When SSH access to KNIME Server is required, it is recommended to use an SSH keypair instead of username/password. This can be configured in the Azure portal at launch time. You are responsible to manage this access key as per the recommendations set within your organisation. The default Network Security Group allows access to the KNIME Server via HTTP, and HTTPS on ports 80 and 443. Additionally advanced admin access via the SSH port 22 is enabled. Azure managed disks use SSE encryption of disks as default (see here). You may also wish to enable Azure Disk Encrypion (see here) for all KNIME Server volumes. You may wish to tag the VM instances and volumes for KNIME Server in order to identify e.g. owner, cost centre, etc. See the Azure Tagging. The software pricing for the KNIME Server is defined in the Azure Portal. Questions regarding BYOL licensing should be directed to sales@knime.com. Costs calculated using the Azure Cost Calculator. There is no 'one size fits all' answer to questions around sizing of deployments. The answer will vary depending on your typical workload, number of concurrent users, desired calculation time, and so on. We provide some recommendations to help get started. KNIME Server Medium are both sold via the Azure Marketplace with built in licenses for 5 named users, and a maximum of 8 cores for workflow execution. Additionally KNIME Server Medium allows 20 consumers to access the KNIME Server WebPortal via the web browser only. Please contact sales@knime.com if you require a larger number of users, consumers, or cores. Typically workflow execution speed can benefit from additional available instance RAM. Therefore we recommend the 'Ev3' series, since they provide the best value access to RAM. The Standard_E8_v3 instance has 64 Gb RAM available, and also 8 CPU cores, thus is the largest instance that KNIME Server Medium can make use of. Full details of Azure VM sizes can be found here. The default OS Disk volume is 30Gb Standard SSD or Premium SSD (depending on selected instance type), and in most cases it is not necessary to increase the volume size. Full details of Azure Disk options are available here. In case you need to add additional storage space later, please see the section Increasing Azure disk size. Deployment of KNIME Server Medium is via a single VM. High-availabilty options are available as part of KNIME Server Large which is not currently documented for Azure. We do not set a fixed default password for the KNIME Server since this is a known bad security practice. Therefore the default password is set to the vmId on the first launch of the KNIME Server. On first login, you are recommended to create a new admin user, and then remove the 'knimeadmin' user. Note that this username/password is for the KNIME Server application, and is different to the KNIME Server VM username/password which can be optionally used for SSH access to the VM. For KNIME Server (BYOL) you will need to apply your license file. This can be done by visiting https://<public-hostname>/knime from your web browser. Logging in using the admin username: knimeadmin, and password: <default-password>`, will redirect you to the license upload page. Here you can apply your license file. A valid license file will be immediately applied, and you can begin to use all KNIME Server functionality. More details on vmId can be found here. Simple testing of the deployment can be done by logging into KNIME Server WebPortal via the web browser. Certain functionality is only available to test via the KNIME Analytics Platform. Access to the KNIME Server from the KNIME Analytics Platform is via the KNIME Explorer. Full documentation is available in the KNIME Explorer User Guide Use the mountpoint address: https://<public-hostname>/knime Username is knimeadmin, and password is <default-password> unless you already changed them. Click on any workflow from the WebPortal repository tree, and wait for the page to load. If the 'Start' button appears then workflow execution is working as expected. For automated testing strategies, see the section: Automated testing. Whilst it is easy and convenient to deploy the KNIME Server through the Azure Portal, there are strong arguments for using a templated deployment using ARM templates. 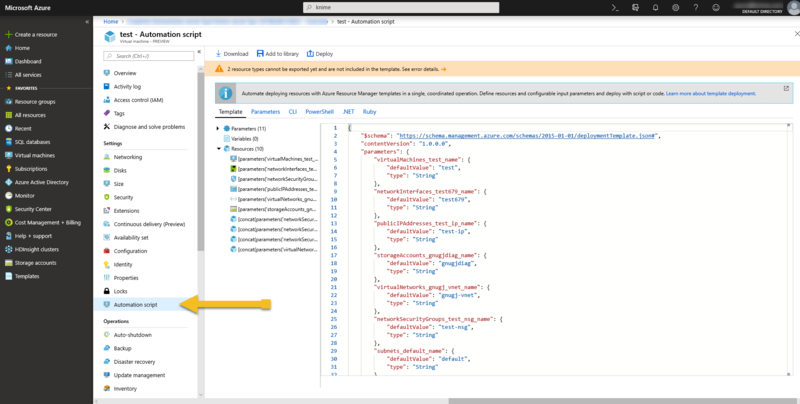 Azure Resource Manager (ARM) templates allow to describe the full state of the final deployment such that it may be redeployed identically in the future. Similarly it is possible to alter a master template which allows for easy reuse of shared configurations, and customizations where required. For an overview of the types of deployments possible with an ARM template see the Azure documentation Quickstart templates. The ARM template describes the Azure infrastructure that is required to be launched by the KNIME Server. If you already have an existing deployment that you deployed through the Azure Portal, it is possible to export the ARM template from the Azure Portal by navigating to the Virtual Machine, and selecting Automation Template as shown in the below image. Below is an example template that could be used as the starting point for a simple deployment. The template itself is parameterised by the following file. Splitting the template from the parameters allows to describe multiple deployments, e.g. dev and prod using a single template, with a parameters file for each. That can help to make sure that the setup in the development environment is the same as the production environment. In addition to the Azure Marketplace images for KNIME Server (Medium, or BYOL) you have the option to install and configure KNIME Server from scratch. In this case the installation process is described in the KNIME Server Installation Guide. Additional configurations of KNIME Server are described in the KNIME Server Administration Guide. In the case where you want to automate the build of a KNIME Server 'Golden Image' you should consider the above two documents as the required information. It will then be necessary to adapt your internal build process to follow this procedure. None of the tools mentioned are required, and you may choose to use alternatives. We describe in brief detail the steps that we follow at KNIME to build the Azure Marketplace images. We use the tool Packer to automate the process. The description is not intended to be an exhaustive list, but an overview of the kinds of things that you will need to consider. Define 'base' image. We choose Ubuntu 16.04 LTS. As part of any KNIME Server deployment you should consider monitoring your service for availability. KNIME Server has several endpoints that can be used to determine the system health. Since KNIME Server Medium runs in a single Availability Zone an Availability Zone fault will be detected by the application fault detection method described below. 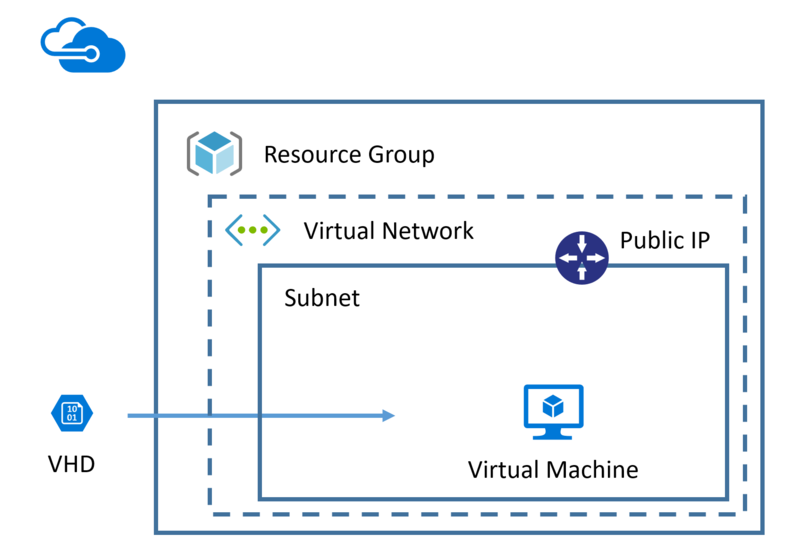 A VM fault can be detected using the standard Azure techniques. A different response indicates a configuration issue, or application fault. It is also possible to test for executor availablity. This requires authenticating against the KNIME Server and calling the following REST endpoint. curl -X GET "https://<public-hostname>/knime/rest/v4/repository/Examples/Test Workflows (add your own for databases)/01 - Test Basic Workflow - Data Blending:execution?reset=true&timeout=300000" -H "accept:application/vnd.mason+json"
You may monitor the storage capacity of the Azure disk volumes (OS Disk and Data disk) using standard techniques and services such as Azure Monitor. For more details see here. We recommend triggering an alarm at <5% free space on either volume. Certificate expiration will be caught if the basic server check fails with an HTTP 400 status code. KNIME Server can be backed up subject to the information available in the KNIME Server Administration Guide. It is recommended to make use of the Azure Snapshot functionality. See the Azure documentation section on taking Azure disk snapshots. To restore an Azure Disk Snapshot, see the Azure documentation section on restoring Azure disk snapshots. KNIME Server starts automatically when the instance starts using standard systemd commands. Once the TomEE application has started successfully, it will automatically launch and executor. This means that in normal operation you will not need the below command. This will launch a new executor, leaving the existing executor running. All existing jobs will continue to run on the old executor, and all new jobs will be launched on the new executor. That is helpful when updating executor preference files without needing to interrupt existing running jobs. When the rmirestart file is automatically deleted, the new executor has been launched. and looking for the process(es) that are not the apache-tomee instance. Managing SSH keys for accessing the KNIME Server is detailed here. 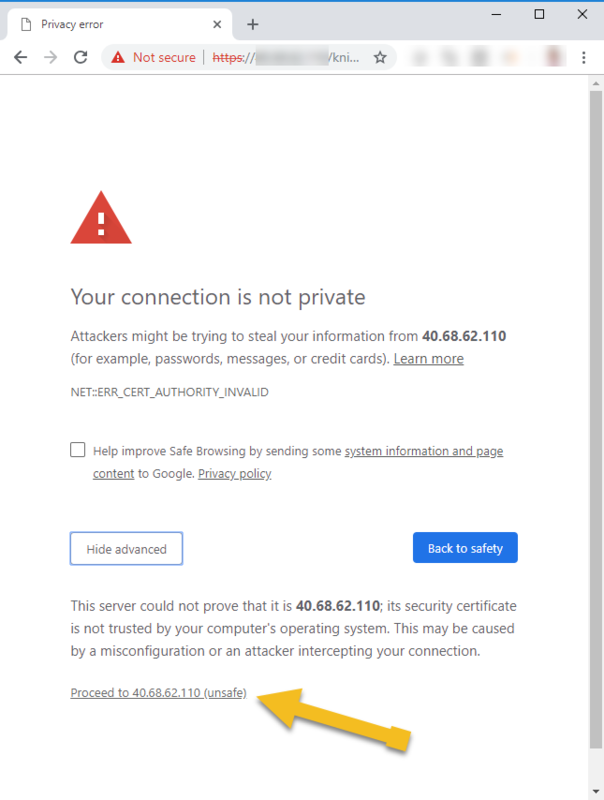 KNIME Server ships with a default SSL certificate. This allows for encrypted communication between client and server. However, since the certificate cannot be generated in advance for the server that you are running on, it will not be recognised as a valid certificate. Therefore, we recommend managing your own certificate as per the guidelines in the Managing Certificates section. When testing with the default certificate, modern browsers will issue a warning as below. Choosing to ignore the warning, will allow you to access the KNIME WebPortal for testing. Patches to the KNIME Server are announced on the KNIME Server Forum. You may subscribe to the topic. Details of update procedure are described in the KNIME Server Update Guide. To make a feature update you have the option to follow the instructions in the KNIME Server Update Guide. It is possible to increase the size of the workflow repository disk size (default size: 30 Gb) after an instance has been launched. Follow the instructions here. In case KNIME Server is not available due to degraded performance of an Availability Zone (AZ), VM fault, etc. It is possible to restore a snapshot and launch a new instance. Availability Zone recovery is managed by launching a new instance into an unaffected Availability Zone, using a recent snapshot. Then attach the elastic IP from the affected instance to the new instance. Region recovery is managed by launching a new instance into an unaffected region, using a recent snapshot. KNIME Server Medium support is supplied via contacting the support@knime.com email address. When contacting KNIME Support you will need to include your Product Code, Instance ID, and Azure Account ID. We aim to respond to your question in under 48 hours. If you require additional support, please contact sales@knime.com for further information.